Striking shape on the outside, comfortable and cosy inside. Transportable yet robust and durable, assembly in a few hours. Features include a fully equipped bathroom, two bedroom levels, and roof terrace. This "large" Hoteltower is composed of two floors plus personal roof terrace. Also known as "small" Hoteltower: a compact, comfortable room in your own tower. The bboxx Hoteltower group at the Forellenhof Rottstock (trout fishing resort) provide accomodation in the middle of the Hoher Flaeming area, near Berlin. The round porthole windows revisit the bboxx's round footprint and create a cosy atmosphere. 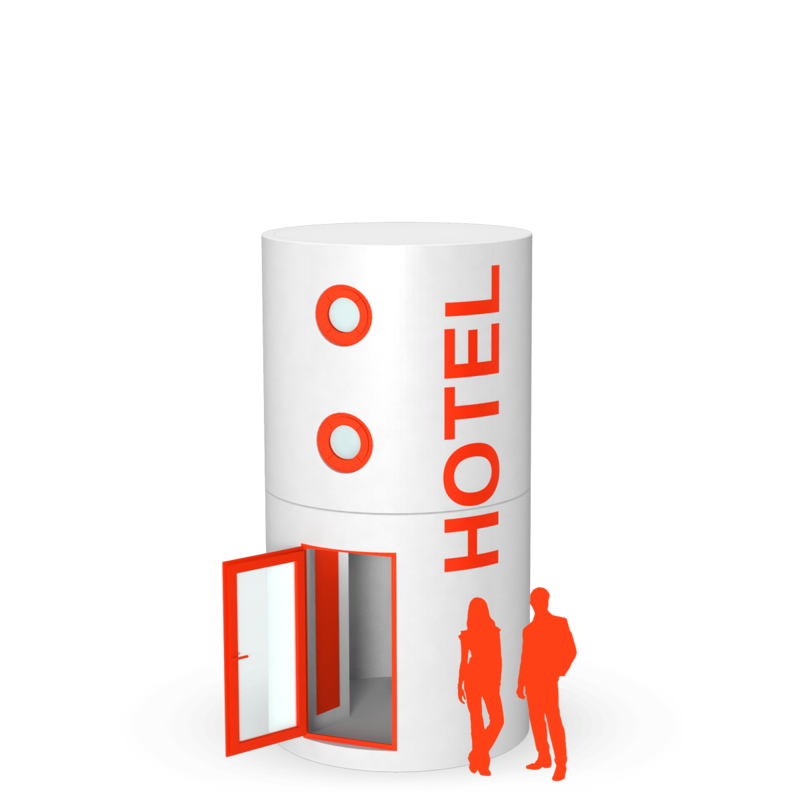 The different bboxx Hoteltower models can be grouped to form eye-catching, individual accomodation solutions. This bboxx Hoteltower structure chosen by Qbe Hotel Heizhaus Berlin opens up to unlimited possibilities. Connected by aluminium bridges and ramps, you can create groups of bed rooms, recreational rooms, bathrooms and roof terraces. HOLI Berlin hostel have chosen this group of bboxx Hoteltowers to expand their number of rooms on the existing hostel premises. The hoteltower rooms are always fully booked, and attract attention from passers-by. 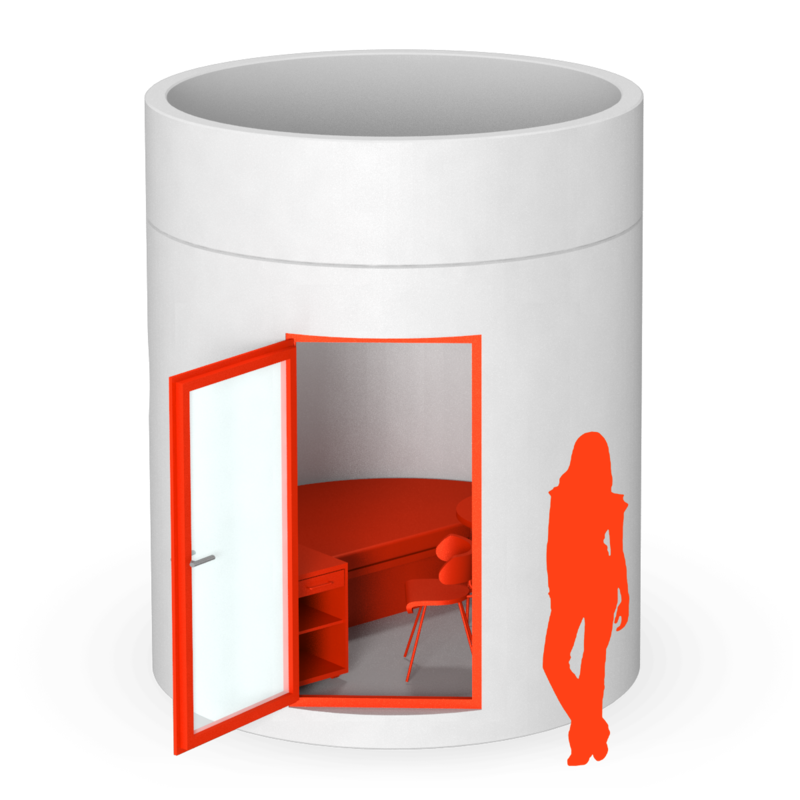 Book your hotel room in your own mobile hotel tower with private roof terrace: bboxx Hoteltower makes this possible. Veloform Media's innovation was developed in cooperation with Qbe Mobile Hotels, a Berlin based company that specializes in a new generation of hotels. Transportable and always on stock, to take changing seasons, fast moving trends and the hottest locations into account. High-quality, durable materials are used for the tailor-made interior design. The solid body can change locations as often as necessary. It's designed for two to four people. The ground floor features a meeting room or fully equipped bathroom, the second and third floor host the sleeping areas. From the central level, spiral stairs lead to the roof terrace. 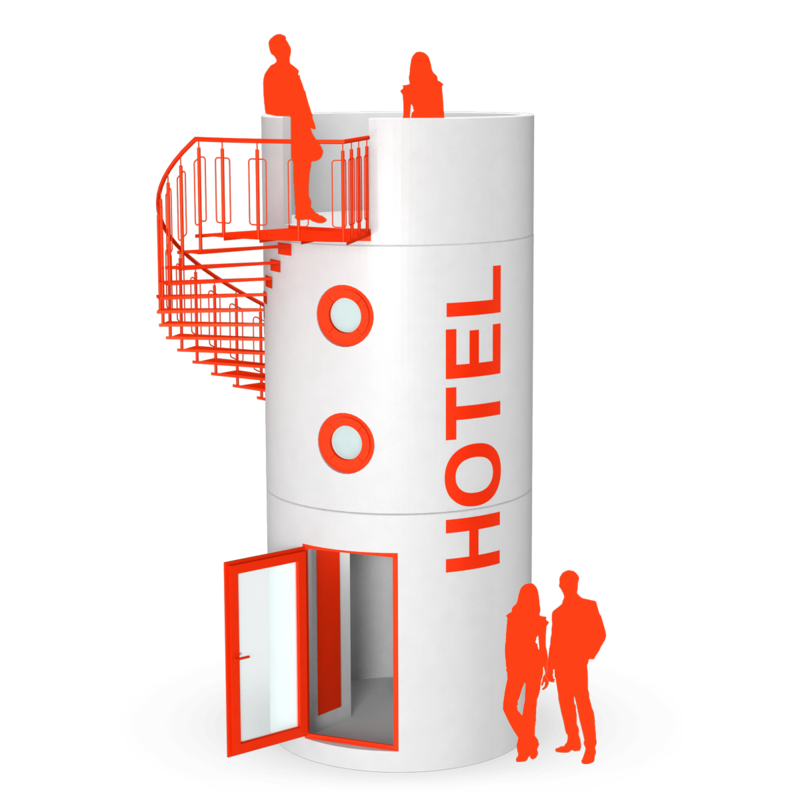 The bboxx Hoteltower comes in three sizes: one level (single room), two levels (two rooms for up to four people) or three levels, with bathroom on the ground floor and roof terrace. Beachbars camp sites, amusement parks, stadiums, and other recreational facilities can add the bboxx Hoteltowers to their existing premises, and offer an unforgettable travel experience. The mobile Hoteltower is also ideal for temporary use, or in natural surroundings where it is not possible to build. For all bboxx Hoteltower locations, go to www.slube.de.